Whether you’re an author trying to self-publish or a musician selling their latest single, if you’re interested in selling digital products with WordPress you’re in good company. The world’s most popular content management system is the tool of choice for many digital entrepreneurs, and with good reason; there are a huge selection of WordPress plugins for selling digital products available. Now while we can’t help you with the creative side of things, we can demystify the technical side of selling digital products from your WordPress site. In this article, we’re going to show you the top four solutions for selling digital products with WordPress and the potential fees associated with them. Do you want to host the product on your site or do you want it hosted with the provider? Do plan on offering discount codes? Are you offering a subscription plan? Are you planning on offering an affiliate program? If you answered yes to one or more of these then you may need a product that has more functionality than just being able to process transactions. The last question you need to answer is: How much are you willing to spend? Let’s examine the top options, starting with the one with the least functionality (but not necessarily the easiest). If you have a single product like an eBook, and you just want to get it posted on your site quickly, the standard PayPal button is always an inexpensive option for the bootstrapping entrepreneur. You have to open a PayPal Business account (if you don’t already have one) and host the product on your website. A disadvantage of going this route is that customers will be taken away from your site to the PayPal checkout page. PayPal offers the fewest ‘extras’ out of all the products in this article, so there’s no in-depth analytics or integration with MailChimp for example. To deliver the product, you redirect the customer to the product download page on your site. WP SUPERSTARS offers step-by-step instructions on how to set PayPal up on your site. 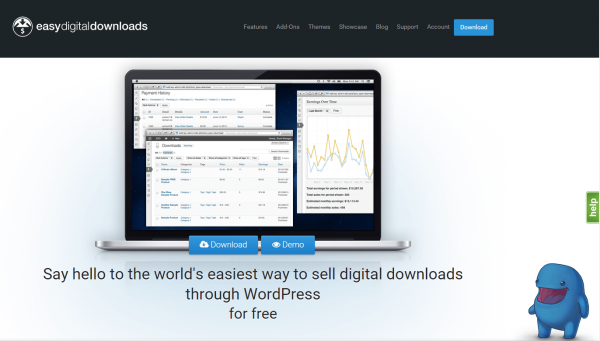 Easy Digital Downloads is a free WordPress plugin that enables you to set up your products, pricing and payment options directly in the WordPress backend. It also includes reports, the ability to create discount codes, a shopping cart feature and a dedicated customer area. Easy Digital Downloads accepts payments via PayPal so if you want to use another payment gateway, you will have to purchase an extension. And while we’re on the subject of extensions, if you require more advanced features like MailChimp integration, affiliate tracking or subscriptions, you’ll have to purchase separate extensions for each. Pretty soon, the cost of this free plugin has skyrocketed, so do your homework ahead of time to see if it makes sense for you. They have a comprehensive document on their site that takes you through the setup and configuration process, with useful options such as charging tax and VAT. If you don’t want to host your product on your site, Gumroad is a popular option due to its easy setup, clean interface and robust feature list. The checkout procedure integrates with your website – meaning customers aren’t sent away from your site to complete the purchase. A full-service option, you can use Gumroad to track analytics, manage your customer list, create special offer codes, create email campaigns and more. Gumroad accepts major credit cards and PayPal, and it offers payouts via ACH or PayPal. This option offers even more ways to pay, allowing you to charge a straight dollar amount for your products, utilize a “pay-what-you-can” option or even offer subscription plans. Their resource center offers plenty of advice along with case studies to get you up and running on Gumroad, but in general it’s a very easy platform to get set up on. You might think a full-service eCommerce system like WooCommerce is more than you need, but we simply have to list this as a contender. It’s very similar to Easy Digital Downloads in that WooCommerce is free and includes PayPal as a payment gateway, as well as other functionality available through paid extensions. They have extensions for subscriptions, memberships, coupons, affiliate programs and more. Similar to Easy Digital Downloads you’ll be hosting your products on your own site (unless you purchase an extension for, say, Amazon S3). 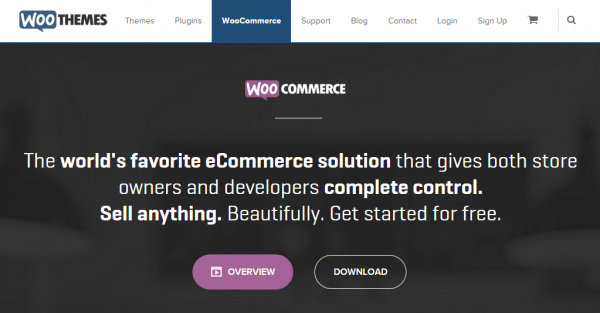 WooCommerce is a very popular eCommerce solution for a reason, though we recommend totting up the costs of all required extensions before settling on this solution. WooThemes have compiled an excellent getting started guide and while it may seem very complex, it’s intuitive and relatively painless to achieve. While we are big WooCommerce fans around here, deciding which option is right for you comes down to the features you need and how much you want to spend. And because the options are free (or fee based with extensions) and quick and easy to set up, you can test them out and see which one you prefer. What’s your favorite option for delivering digital products? Let us know in the comments below! I use Easy Digital Downloads on two of my sites and have found it pretty comprehensive. I had some problems early on and found that disabling the W3 Total Cache plugin solved the problem but it did take quite a lot of reading and forum advice to get it solved though. I use a combination of Easy Digital downloads, LeadPages and PayPal altogether.